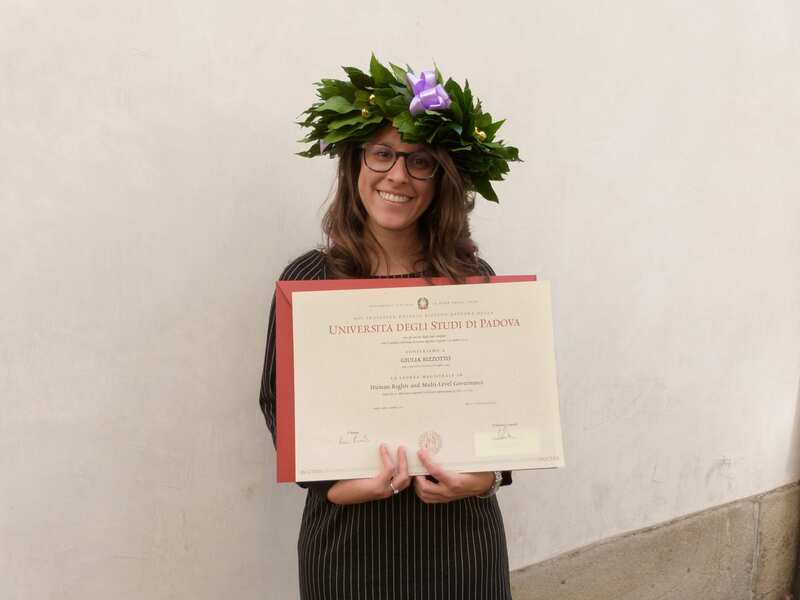 30 October 2017 // Congratulations to Giula Bizzotto! During her time as an intern at IF, Giula researched the relationship between assistive technology and the human body, with a special focus on people with Spina Bifida and their rights. She received full marks with honours for her dissertation, which was based on her research at IF. A big thank you to everyone who answered her questionnaire! A worrying conclusion is that the costs of assistive technology are a burden for people with Spina Bifida and families with children with Spina Bifida. Giulia compared data from IF’s member ASBI in Italy to the results of other IF members from various European countries. Data showed that a large portion of both Italian and other European participants evaluated assistive technology positively. However, 35% of IF European members, and 22% of ASBI’s members, pointed out that assistive technology is only one of the tools to improve accessibilty for people with disabilities. To improve their quality of life, it is also important to have information on tax deductions, the presence of a specialised contact person, and better access to information in general. Respondents also mentioned the removal of physical barriers in public life and, for instance, the provision of ramps for wheelchair access as a requirement for better accessibility, and the need to include people with disabilities in both the political and social environment. Specifically linked to assistive technology, someone proposed the development of better devices for each type of disability. The majority of respondents agreed that assistive devices allow them to be comfortable with others and ameliorate their relationship with their own body. Still, for their autonomy, people with disabilities also need access to education, rehabilitation, counselling, employment, housing, etc. Through her work, Giuliana emphasizes the importance of a human rights approach to disability, because having access to assistive devices allows people with disabilities to participate in social life, in equal opportunity with others. Assistive technologies can support their performances and thus contribute to their social inclusion. Regarding the types of assistive technology used by people with Spina Bifida and/or Hydrocephalus, different devices were mentioned, both among Italian participants and other European respondents. First and foremost were those connected to mobility support, such as wheelchairs (both manual and electric), crutches, walking cane, and braces. Secondly, technology connected to personal care, such as bath tub lift, shower stool, etc., and medical technologies like catheters and orthopaedic footwear. Thirdly, devices for an accessible home, such as rails, lifts, and stair lifts. The most important characteristic of all these types of assistive technology is linked to the fact that they should be tailored according to the individual needs, age and gravity of the condition.